A vertex cover of an undirected graph is a subset of its vertices such that for every edge (u, v) of the graph, either ‘u’ or ‘v’ is in vertex cover. Although the name is Vertex Cover, the set covers all edges of the given graph. 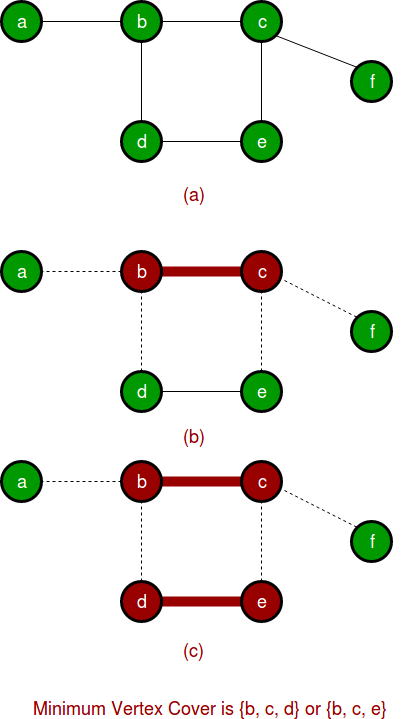 Given an undirected graph, the vertex cover problem is to find minimum size vertex cover. Vertex Cover Problem is a known NP Complete problem, i.e., there is no polynomial time solution for this unless P = NP. There are approximate polynomial time algorithms to solve the problem though. Following is a simple approximate algorithm adapted from CLRS book. 2) Consider a set of all edges in given graph. Let the set be E.
...b) Remove all edges from E which are either incident on u or v.
How well the above algorithm perform? Following are C++ and Java implementations of above approximate algorithm. // Initialize all vertices as not visited. // (u, v) from remaining edges. // Add the vertices (u, v) to the result set. // picking an edge (u, v) from remaining edges. Time Complexity of above algorithm is O(V + E). Although the problem is NP complete, it can be solved in polynomial time for following types of graphs. We will soon be discussing exact algorithms for vertex cover. last_page Flood fill Algorithm – how to implement fill() in paint?